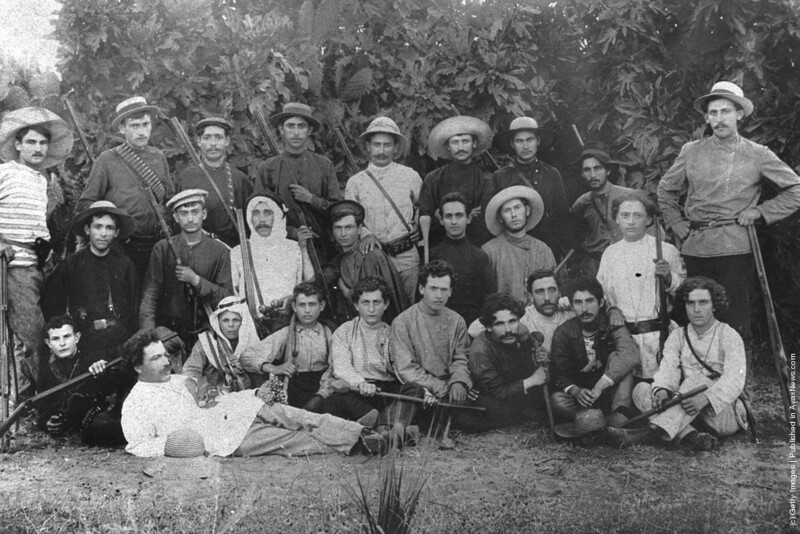 Members of Hashomer, a Jewish self-defense militia, pose with their rifles October 1, 1900 in the community of Rehovot during the Ottoman rule of Palestine in what would later become the State of Israel. 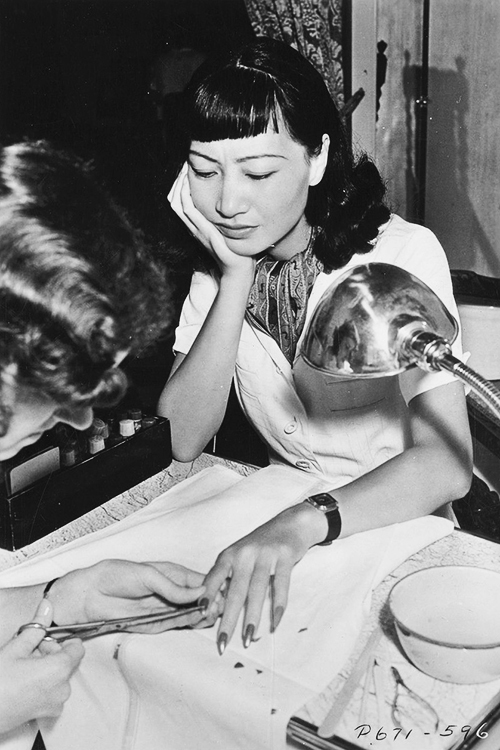 Anna May Wong gets a manicure, 1939. Those nails look like daggers. 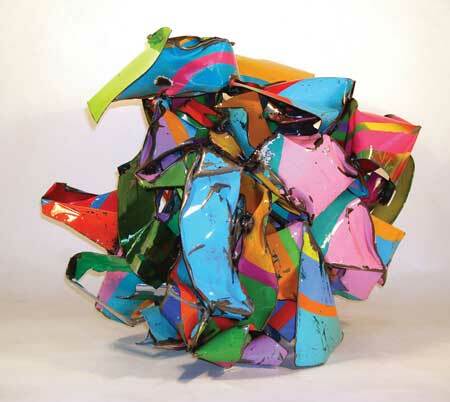 Sculpture by John Chamberlain, painted sheet metal. 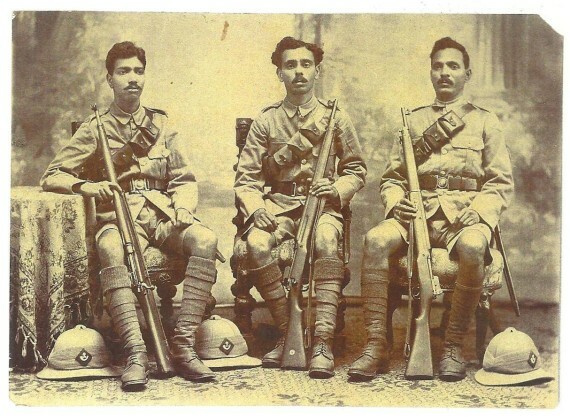 Members of the Jewish Brigade Local Defense, India, 1939. 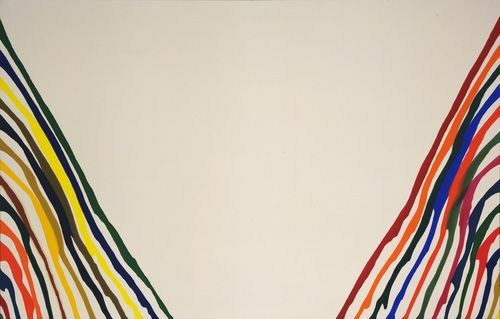 “Beta Lambda”, 1961 by Morris Louis (1912–1962). 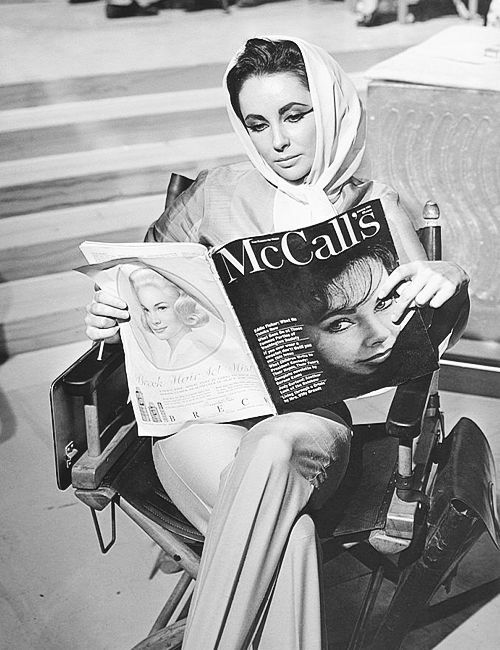 Elizabeth Taylor reads her own interview in McCall’s. 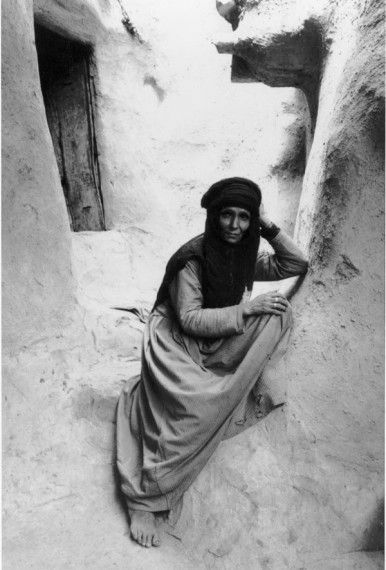 Yemenite Jewish Woman, 1983. Photo by Frederic Brenner, from his series “Diaspora.” There are now only a handful of Jews remaining in Yemen. 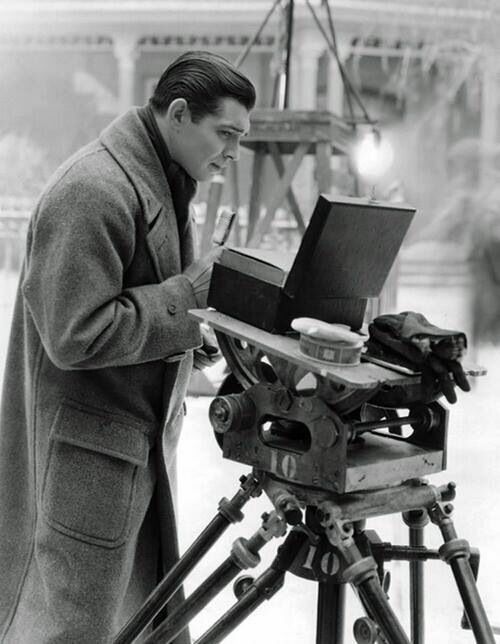 A young Clark Gable checks his hair and makeup on location. The portable makeup case is sitting on a camera tripod. 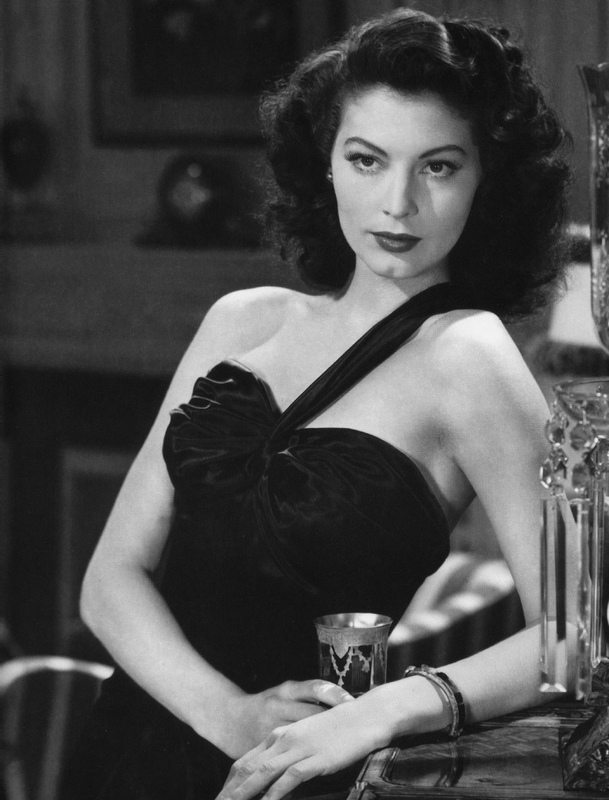 There was a time when guns were not demonized by the Hollywood elite. 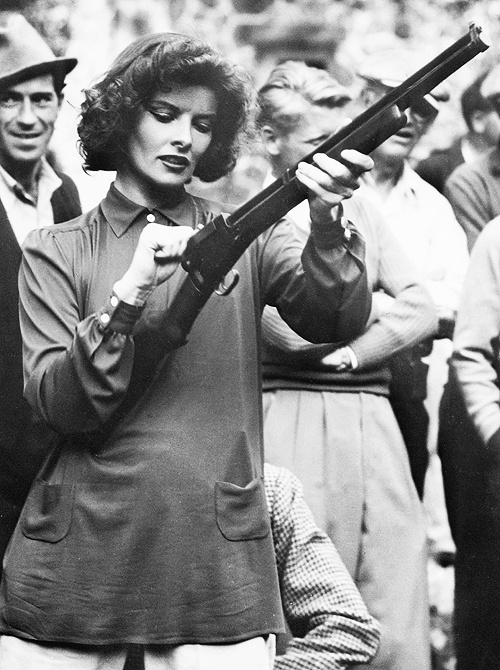 Katharine Hepburn, 1935. I take a daily three mile walk at around 4:30 AM. When the sun rises the colors can get pretty abstract. This pic was taken with my iPhone and is unedited. 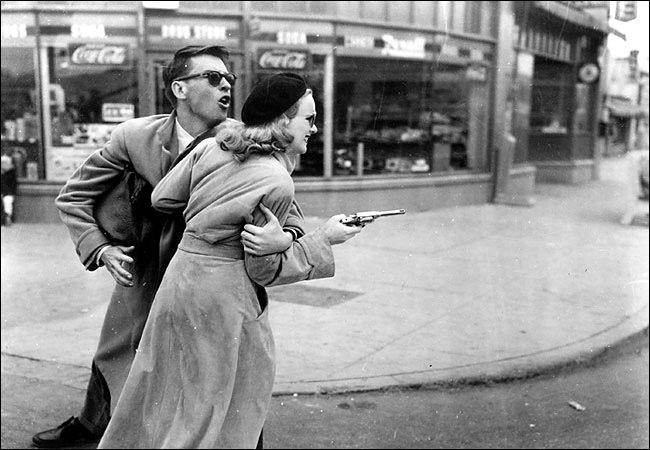 Peggy Cummins as one of the greatest gun wielding noir babes in movie history, “Gun Crazy,” 1950, a masterpiece. Randy’s Donuts here in Los Angeles is an architectural landmark, sort of like the Empire State Building in NY. Every time I drive past I see a long line of customers. The donuts must be good but I keep kosher so I’ll never know. I was cruising by the other day and had to stop for a red light. I leaned over, and grabbed this picture with my iPhone. Who says LA lacks culture? 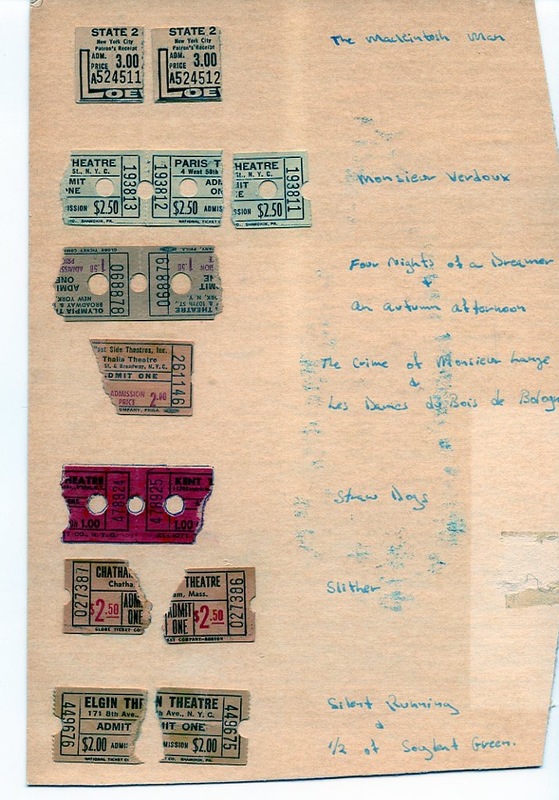 For many years I kept track of the movies I attended by holding on to the ticket stubs. I had hundreds of them. Somehow, my collection got lost. I recently discovered one sheet of stubs — a blast from the past. At the bottom you can see that I watched 1/2 0f Soylent Green. That’s because I hated the film and walked out. Look at the price of attendance. 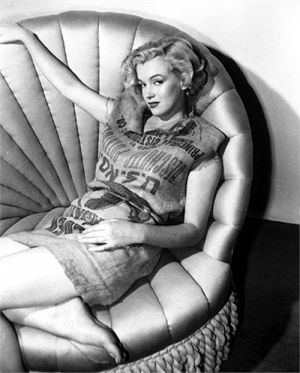 Marilyn Monroe in, yes, a potato sack. Photo by Earl Theisen, 1951. 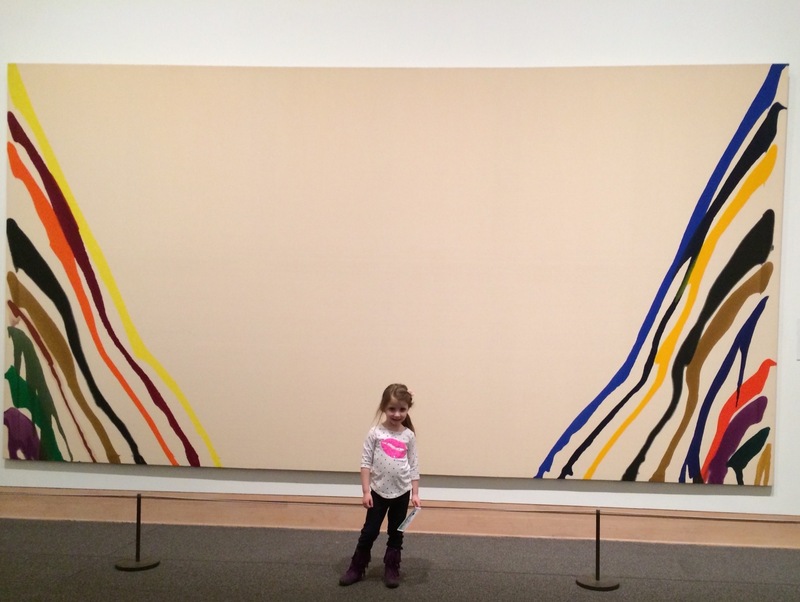 Standing in front of a superb Morris Louis painting (similar to the one above) you get a sense of the monumental scale in which he often worked. 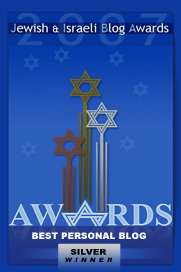 Maayan Ariel wishes all our friends and relatives an artistic and inspirational Shabbat. Robert, congratulations on getting a decent photo from the car. I drive every day, from one gardening job to the next, and I often see something that’d make a neat pic – then it’s a scramble for the fone, get it to camera, end up with a pic of the A-pillar and a blurred red shape, being the cool car I wanted to shoot. Great pic of Maayan in front of the Louis painting, lovely setup. With long hair, boots, black jeans and a long T-shirt w 3/4 sleeves, she’s dressing an awful lot like I do. Ne’ermind Grandad, she’ll grow out of it. One of many reasons why I consider Islam a Jewish heresy. That’s also why Muslims hate Jews. Mohammed thought he had figured out a better mousetrap, so to speak, and the Jews rejected him. Islam is an imperialist religion in every way. Soylent Green was IMO one of Heston’s forgettable movies. 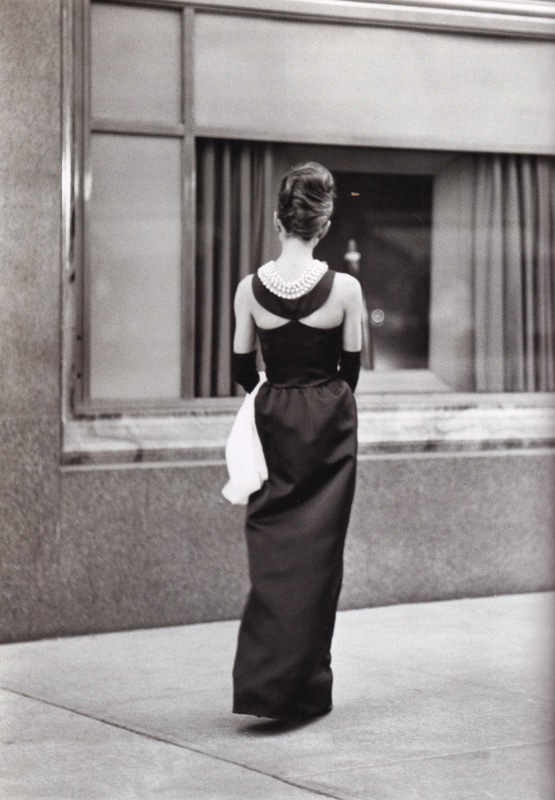 Perhaps I have a bit of eternal optimist in me; when sitting though a stinker I hope that it will turn around – they rarely do. One of the most over-hyped movies I ever saw was “Two Laned Blacktop”. The fact that its score on imdb is 7.3 is perplexing. 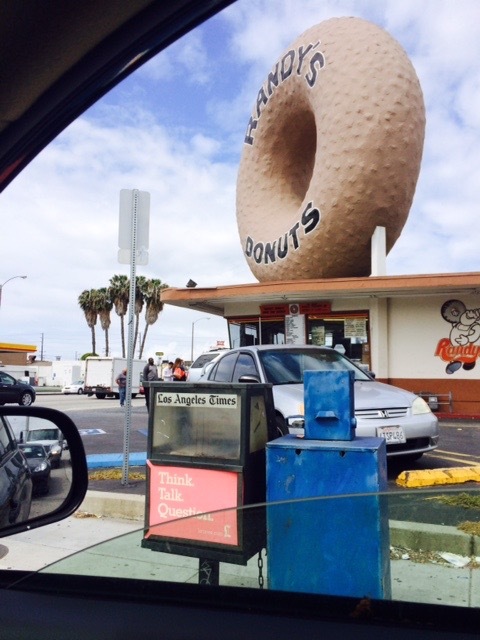 Randy’s Donuts – is an iconic LA landmark. 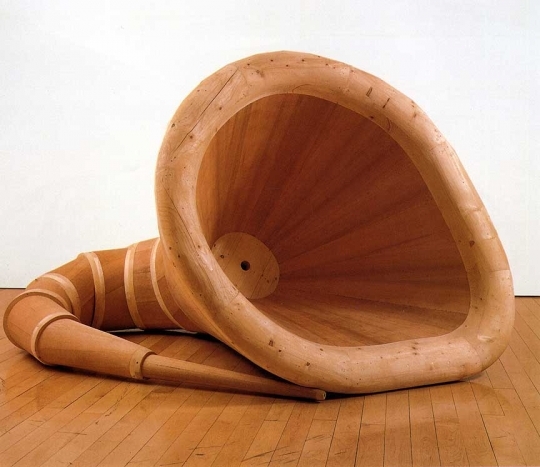 So was that big shoe – what kind of business was that? 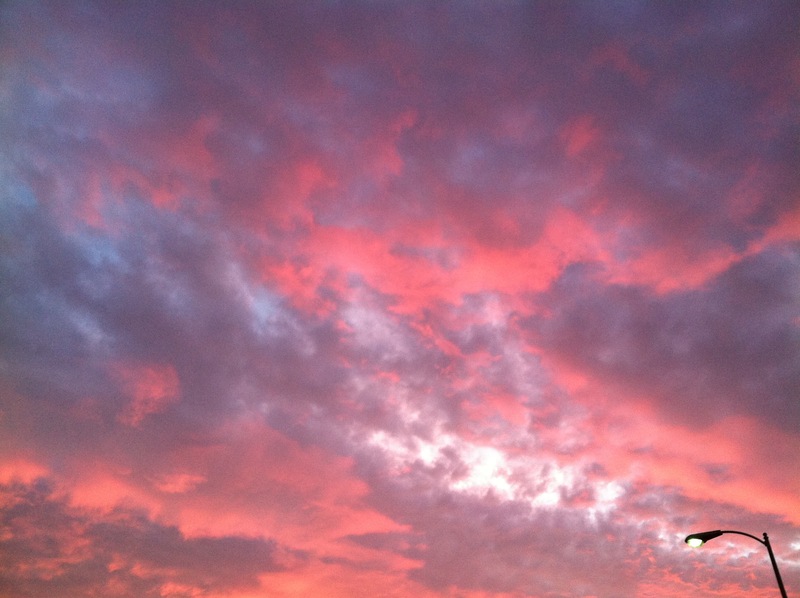 Sunsets/Sunrises – someone once said that G*d is an artist; and every sunset/sunrise a different landscape. TCM broadcast “Soylent Green” a few months ago. I said to myself, “Give it another shot. Maybe you were wrong.” I watched 1/2 of the movie and quit. I was right. It’s a stinker. I rather like Soylent Green. I acknowledge the premise is pretty silly. “Two Lane Blacktop” got a big pre-release boost when Esquire magazine published Rudy Wurlitzer’s screenplay, claiming that it was genius. 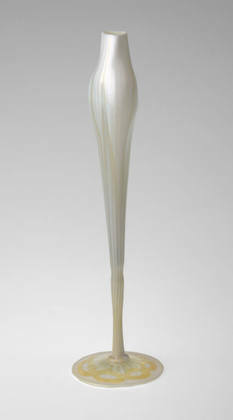 They hailed The Girl, Laurie Bird, as a major new discovery. The script is deadly. 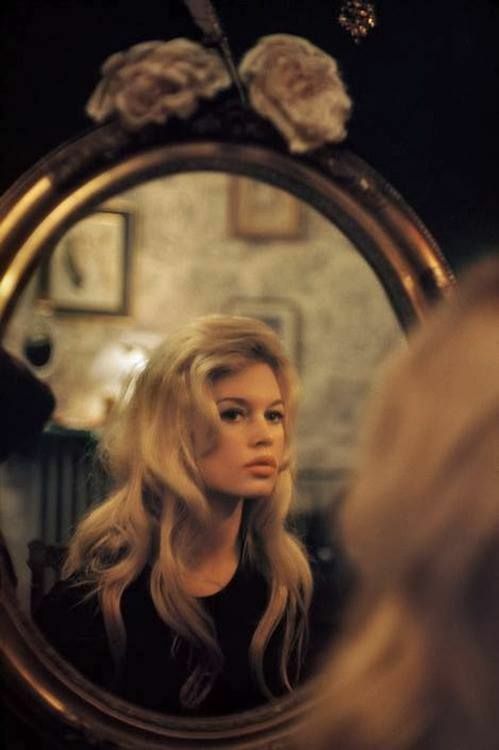 Laurie Bird, a model who only appeared in three films, killed herself age 25 in Art Garfunkel’s apartment, could not act. Neither James Taylor nor Dennis Wilson could act either. 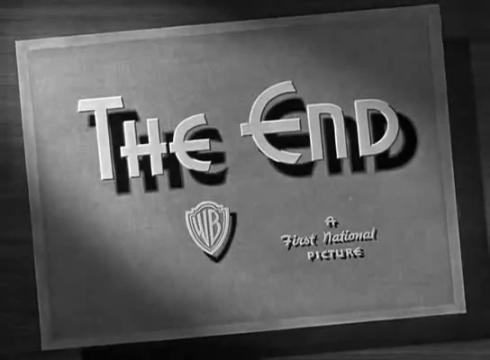 The film might be one of the most wretched things ever put on screen. Robert – that is what I thought while sitting through the entire movie at a small theater in Charlottesville, VA 40 some years ago. Only good thing to come from that movie was the ’55 Chevy – later staring a few years later in American Graffiti with a young Harrison Ford; at least the car redeemed itself. 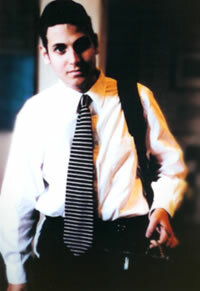 After that movie I learned to give movie reviews a grain of salt – only reviewer I trust implicitly is Prof Avrech! Your granddaughter sets off the painting perfectly. Well posed! Thanks so much. Good Shabbos. The photo of Taylor looks like on the set of “Cleopatra” because of her eye makeup. Notice that Gable doesn’t yet have his mustache. I’ve seen a few of those early movies of his, including the one in which he sang & danced. 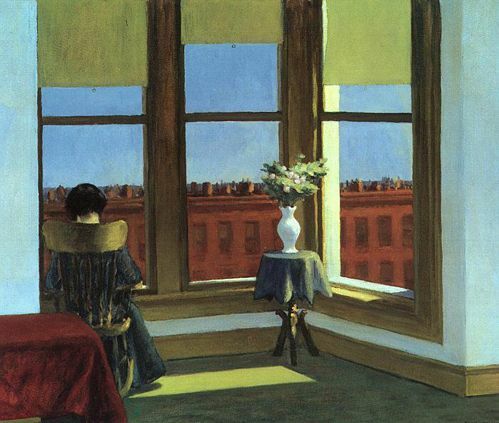 Hopper is one of my favorite 20th century artists. That giant donut sign has been there for decades. I remember it from my childhood and it’s probably older than that. Randy’s was built in 1953. It really has Landmark status in LA. Beautiful pictures, as always, Robert. 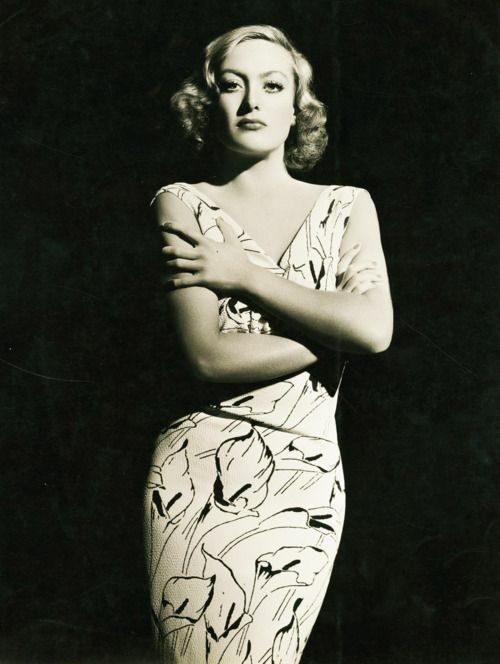 I have to say I like the younger Crawford better than the brittle waxwork parody she became in her later years. There are many, many brands of donuts that are kosher. Randy’s is just not one of them. Alright, I’ll ask the dumb question, what in the world makes a donut kosher or not? 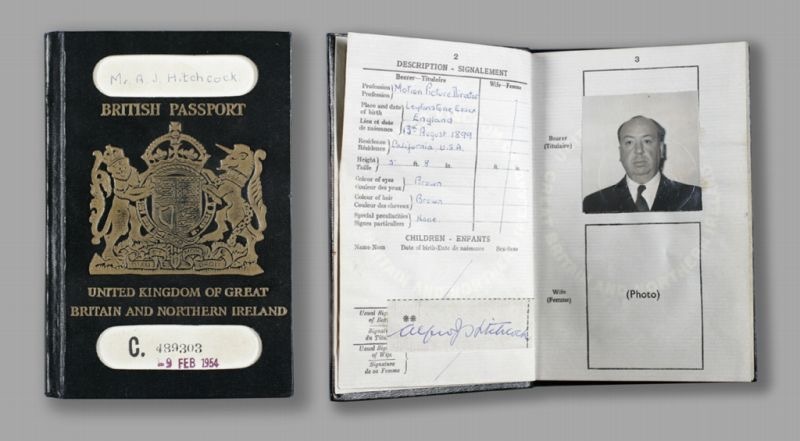 I’m Irish, so say nothing about potatos, to us they are an article of faith. Most simply: The ingredients must be certified as kosher, and there has to be proper Orthodox Rabbinical supervision of the facility where the donuts are manufactured. The laws of kosher food can be complex, so I’m just giving you the basic bullet points. Potatoes, in and of themselves, are kosher as they are a natural agricultural product. But if you cook a potato with bacon, then the potato becomes unkosher via contact with the bacon which can never be kosher as pork is a forbidden food. Well, we all have our ways, my tribe can have some odd things such as funerals…. “So, if there are to be two funerals at the same place on the same day, the lively competition as to which shall get first into the churchyard not unfrequently leads to a fight. I have a vivid recollection of one such fight in our neighbourhood, when much blood flowed. It arose in this way. Two funerals were approaching Abington Churchyard in opposite directions, one from Murroe, the other from Barrington’s Bridge. The former was nearing the churchyard gate; on perceiving this the people in the other funeral took a short cut by running across a field, carrying the coffin with them, which they succeeded in throwing over the wall of the churchyard before the others were able to get in by the gate. This was counted such sharp practice that they were at once attacked by the other party, and a battle royal ensued. Not Jewish, but I know a little (enough to be dangerous?) about the rules. Donuts are often cooked in pork fat. That’s a deal killer right there. A donut might include milk in its recipe and be cooked in beef fat. Another deal killer. Those ingredients may be acceptable in themselves, but not in combination. You don’t generally know these details when you buy a donut. 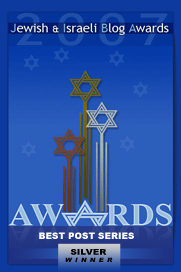 Hence, observant Jews will stick with stuff that is certified kosher.